The greatest band of all time released the greatest album of all time in 1969. This was their last recorded album and came with the most iconic album covers ever. This was The Beatles’ Abbey Road. The album starts off telling the world to “Come Together” for this epic experience. This track showcases many blues elements int George Harrison’s playing whilst giving a distinct driving feeling. “Something” is more symphonic in nature and reveals how well this band can orchestrate a piece even at a time where they were barley functioning as a band. “Maxwell’s Silver Hammer” brings out the light and fun side of the band with it’s more poppy elements and bouncing feel. The silliness of the song is also characteristic of the band. You can even here Paul McCartney laughing as he sings the lyrics to this tune. The Beatles then shuffle into “Oh! Darling”. The groove in this song is unreplicable and just so perfect. This is why they are the greatest band to exist. Ringo Starr (Richard Starkey) struts his stuff in “Octopus’s Garden”. The Beatles were a multi-faceted band although the quality of Ringo’s songwriting is often debated. They then revert back to a very blues like song, “I Want You (She’s So Heavy)”. The lyrics are repeated often and John Lennon’s guitar playing is typical of the blues style of music. Like most blues style songs this one too is written about a woman, specifically Yoko Ono, John Lennon’s lover. The abrupt end of the track leads into one of the most beautiful guitar intros of a songs ever. The intro into “Here Comes The Sun”. It is impossible to listen to this track and not put a smile on your face. The bright key of A major does this track well. The electric harpsichord is not something you hear in your average rack band, but then again, The Beatles are not your average rock band. “Because” features this interesting instrument in the intro and, upon further research, features the chords of Beethoven’s “Moonlight Sonata” backwards. Now the real fun begins. “You Never Give Me Your Money” kicks of the incredible and classic Abbey Road melody. The chirping crickets lead us into the somber “Sun King” where John even ventures to sing in a mixture of Spanish and Italian. “Mean Mr. Mustard” again brings out the silly side of The Beatles with a more light tune. “Polythene Pam” shows off Ringo’s cool floor tom groove and cool percussion which helps drive this song and give it a cool feel as it leads right into “She Came In Through The Bathroom Window”. 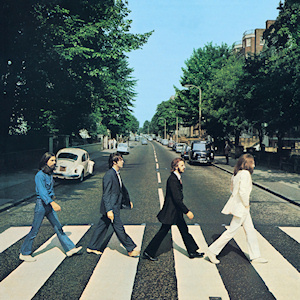 The album then breaks as it goes into “Golden Slumbers” which Paul’s voice is the star of. This leads into one of my personal favorites “Carry That Weight”. The vocal chorus effect is so powerful and the melody continues through the two songs. Ringo’s fill’s really accentuate the vocals as well. Ringo then jams out on “The End” as he has his classic drum solo. Even though the album seems over, The Beatles sneak in 25 seconds of “Her Majesty” to end this killer album.